Fig. 11. Following a 180° inversion pulse, tissues A and B have different rates of T1 recovery and cross the zero signal (inflection point) at different times (TI). sequences. Other additional sequences include postcontrast T1 (for infectious and inflammatory causes or tumor), gradient echo (GRE)/susceptibility (for hemorrhage and in the case of the cervical spine for its myelographic effect), fat suppression, MRA, or MRV (for stroke and sinus thrombosis) and in selected cases such as multiple sclerosis the use of magnetization transfer (MT) imaging. 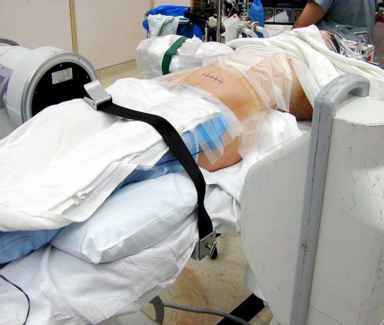 Fast scan techniques such as fast spin-echo (FSE) and echoplanar imaging (EPI) are also employed under appropriate situations that require very short TR and TE times such as in dynamic/perfusion and functional MRI. 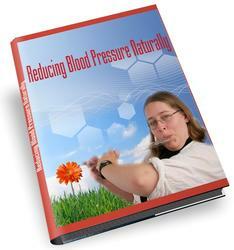 MR spectroscopy and functional MR are discussed in detail in Chapters 3 and 4, respectively. Inversion recovery is a technique making use of the difference in T1 recovery of tissue protons, especially water and fat, thus also representing one of the ways to suppress fat. Very simply, the sequence design consists of a nonselective 180° RF pulse followed by the regular slice-selective 90-180° spin-echo pulses. This initial 180° pulse cause the main vector to flip 180° from the original vertical position that then starts to recover/relax. As different tissue protons recover and cross the zero line at different times, the timing of when to record the echo or read out determines whether water or fat will give a signal. The time it takes for the relaxing proton to traverse the zero line or inflection point is designated as TI or inversion time (Fig. 11). In other words, the FLAIR sequence is in effect a water suppression technique as the echo is acquired at TI of CSF (~2000 ms). Only "normal" water will show loss of signal, as in CSF or nonproteinaceous cyst. Pathological increases in water content such as cytotoxic or vasogenic edema and demyelinating processes will appear as high signal areas on FLAIR. 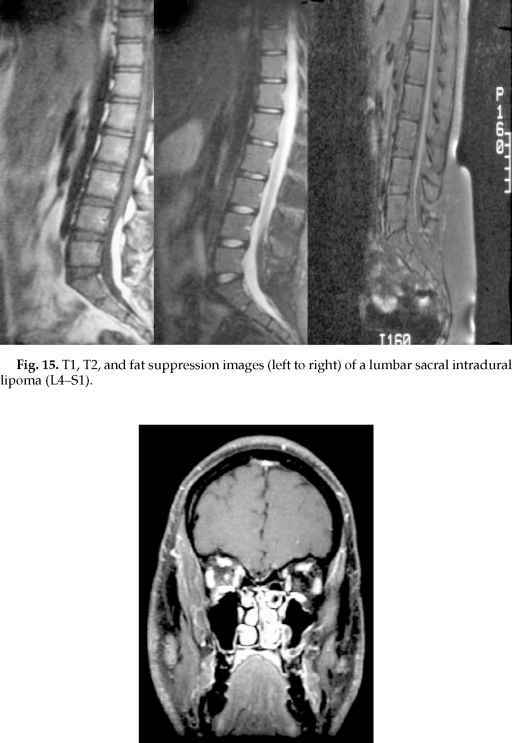 One can therefore recognize the advantage of such a sequence to facilitate the ease of identifying small lesions, especially those that are in proximity to CSF, as in the case of multiple sclerosis and white matter disease (16,17) (Figs. 12 and 13). Fig. 12. 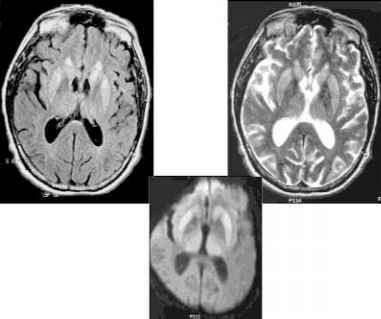 FLAIR image of the brain shows distinctive plaques in the periventricular white matter in a patient with multiple sclerosis. If the data is acquired after a period of approx 160 ms (TI of fat), a fat-suppressed image will ensue, a sequence also known as short tau inversion recovery (STIR). As in the case of most MR sequences, it is almost always a tradeoff in which the inversion technique costs time and is particularly sensitive to CSF and other motion artifacts. This, therefore, necessitates a more cautious interpretation of abnormal signal on FLAIR imaging; at the same time, different techniques have also been proposed to correct such artifacts (18). Other methods of fat suppression are also available including opposite phased imaging and frequency-selective saturation. The former applies to a gradient-echo pulse sequence whereby the relative phases of water and fat protons change from successive echo times owing to their different resonant frequencies. When they are in phase, their signals are additive; when they are out of phase, the signal from the pixel reflects their difference, and the contribution from fat is essentially cancelled. This method is more useful for small fatty containing lesions. (19) (Fig. 14). In contrast, frequency-selective saturation is a method used for large areas of fat whereby a slice-selective RF pulse with a value the same as the resonance frequency of lipid is applied followed immediately by a spoiling gradient pulse to dephase all the selected lipid signal. Fat suppression is especially useful in orbit imaging and in the differentiation of fat-containing lesions (Figs. 15 and 16). Another important clinical use of fat suppression is in the setting of arterial dissection: T1 with a fat suppression technique facilitates the visualization of bright signal blood within the vessel wall that is surrounded by highsignal fatty tissue (Fig. 17). Fig. 13. 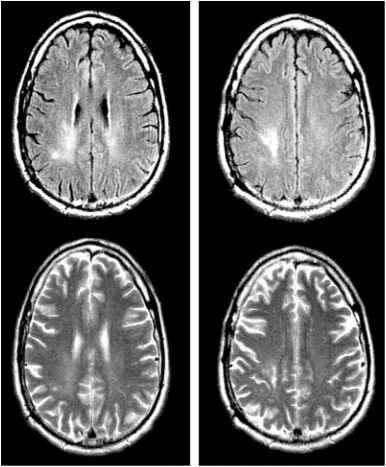 T2 weighted (bottom) compared to FLAIR (top) images illustrate the better ease of localization of white matter disease against a grayer background of the latter. Fig. 14. 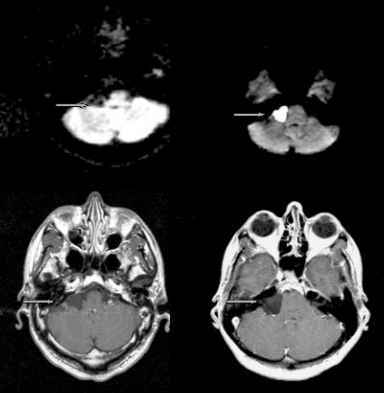 Fat suppression (top right and bottom) of a small, high-signal left IAC lesion on noncontrast T1 images consistent with a lipoma. will completely put it back to the original state as if no extra pulse gradients were ever applied. The timing and strength of these gradient pulses determine the b value factor (amount of diffusion weighting): the signal loss is proportional to the exponent of -bD according to the Stejskal and Tanner equation (20). The ADC at each voxel can then be calculated by measuring signal intensity using two different b values (often with b = 0, i.e., without diffusion weighting, and b = 1000). 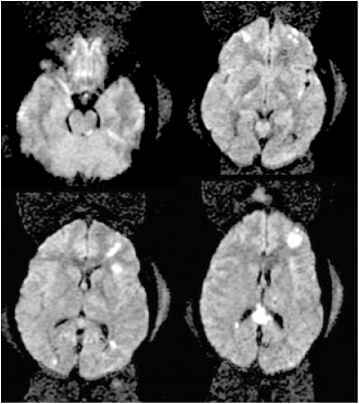 Clinically, three sets of images are available, an ADC map (restricted diffusion or low ADC as in acute stroke shows signal loss), a b = 0 map serving as a baseline signal because the diffusion pulse sequence is slightly T2 weighted, and diffusion-weighted images (DWIs; b = 1000) in which truly restricted areas appear bright against a gray background). The most mobile water molecules such as in CSF and cysts will have the most signal loss and will appear bright on ADC (high diffusion coefficient) and b = 0 maps but as low signal on the b = 1000 images. Both ADC and b = 0 maps are useful to rule out the T2 "shine-through"
Fig. 16. Coronal T1 postcontrast fat saturation image of the orbit shows enhancement of the right optic nerve secondary to optic neuritis. Fig. 17. Increased signal within the right vertebral artery (left) and the wall (bright cresentic area) of the right internal carotid artery (right) on T1 fat saturation images consistent with dissection. phenomenon, whereby an area with increased T2 signal may appear bright on diffusion images. If the area is truly restricted, the ADC map will show a corresponding dark signal and the b = 0 map should show a less bright area than the b = 1000 image. As a reference the ADCs of CSF, gray matter, and white matter are 2.7, 0.8, and 0.6 x 10-5 cm2/sec respectively (21) (Fig. 18). Fig. 18. 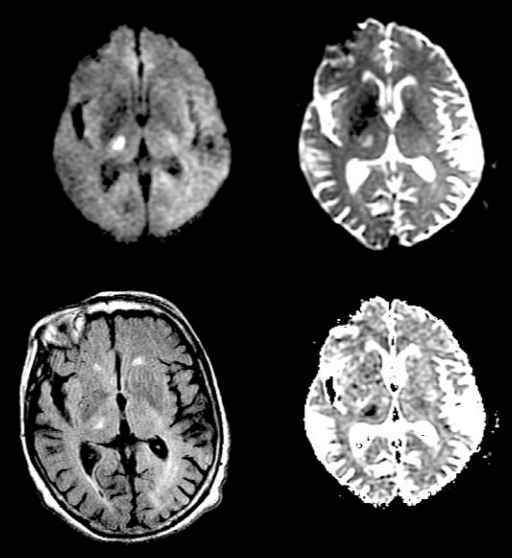 Diffusion-weighted (b = 1000), b = 0, ADC, and FLAIR images (clockwise from upper left) of an acute right thalamic infarct. 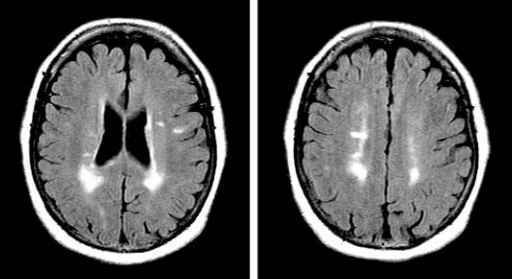 encephalitis, Creutzfeld-Jakob disease (23), diffuse axonal injury (Figs. 20-22), or increased viscosity and cellular matrix such as in abcess and epidermoid cyst will all demonstrate increased signal on DWI (24,25) (Figs. 23 and 24). Fig. 20. 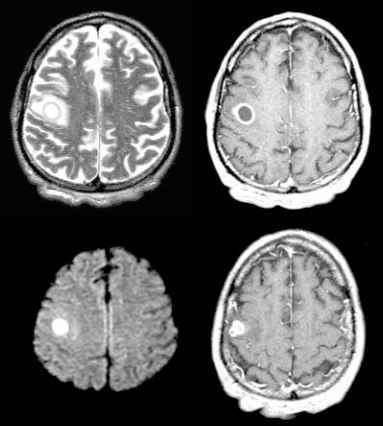 FLAIR, diffusion-weighted (b = 1000), and postcontrast T1 images (clockwise from top left) of bilateral cingular and insular involvement of herpes encephalitis. Fig. 21. Restricted diffusion (bottom) of bilateral basal ganglia secondary to the sporadic form of Creutzfeld-Jakob disease. Fig. 22. 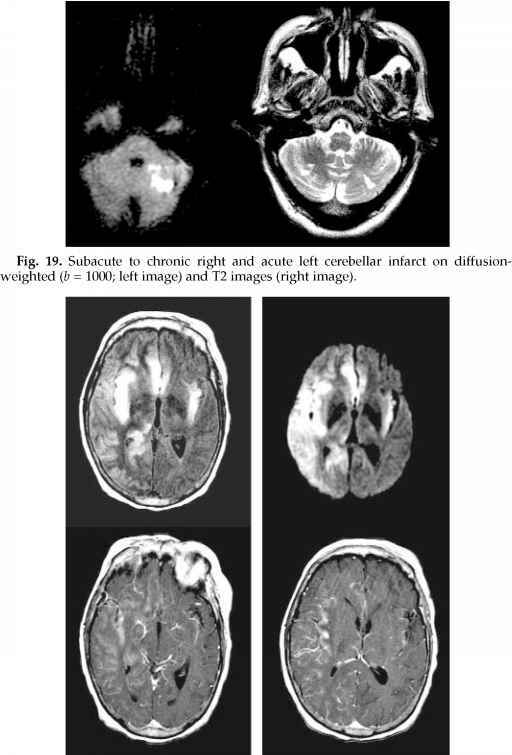 Restricted diffusion in left midbrain, bifrontal, splenial, and parietal areas in diffuse axonal injury (clockwise from top left). Fig. 23. 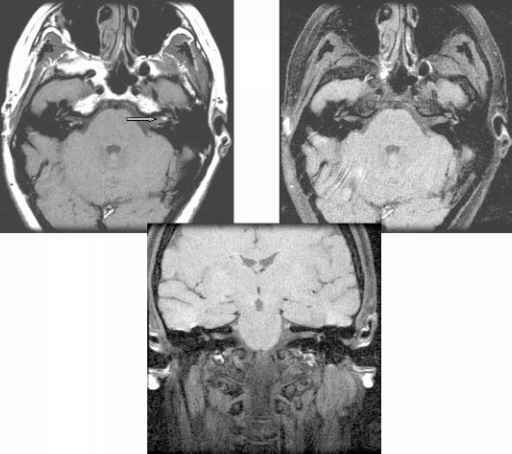 Axial T2, postcontrast T1, and diffusion-weighted images (clockwise from top left) of a typical brain abcess of the right frontal lobe. selves can also be oriented in various directions in space. Accordingly, a minimal of six different non-coplanar direction measurements is necessary to determine the tensor elements owing to the existence of six independent variables. In clinical practice, most scanners are equipped to perform the "trace" of diffusion tensor by acquiring DWIs in three directions and averaging these to give trace-weighted diffusion images. In other words, the diffusion tensor information can be applied in two ways; along the scalar aspect, the values can be combined to give indices reflecting the degree of anisotropy, whereas in the directional aspect, orientations of the principal diffusion axis allow the inference of the orderly microstructure of tissues such as myocardial fibers and white matter tracts in the brain. The latter has the potential of mapping white matter tracts in diseased CNS conditions or even more so in the setting for pre-and intraoperative evaluation of the proximity of essential white matter tracts to brain tumors (26) (Fig. 26). Fig. 24. 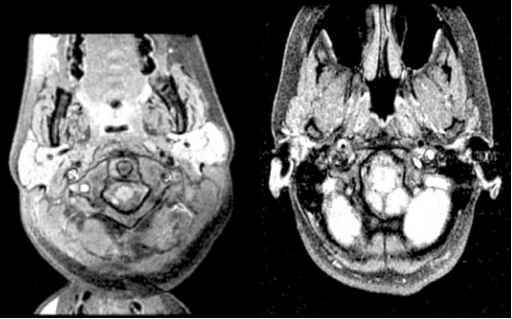 Low signal on diffusion of right cerebellar pontine (CP) angle arachnoid cyst (left, top) compared with high signal right epidermoid (right, top) with their respective postcontrast images (bottom). Fig. 25. The tensor matrix consists of nine components; practically, only six are used because Dzx D and D are the same as Dxz D^ and Dyz. 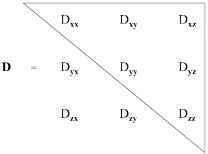 The "trace" of the tensor can be representecl by Dxx Dyy and Dzz. Fig. 26. 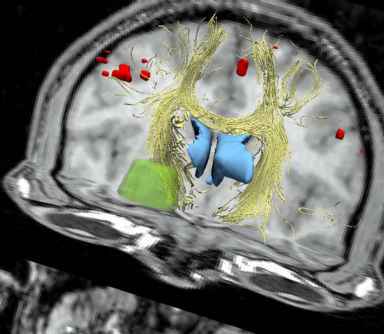 Tensor diffusion representation of white matter fiber tracts along the corpus callosum and cortical spinal tract as they are deviated by a deep right frontal tumor.